We review the new Sigma dp2 Quattro - a new camera with an unusual design and unusual sensor, designed for the ultimate image quality. 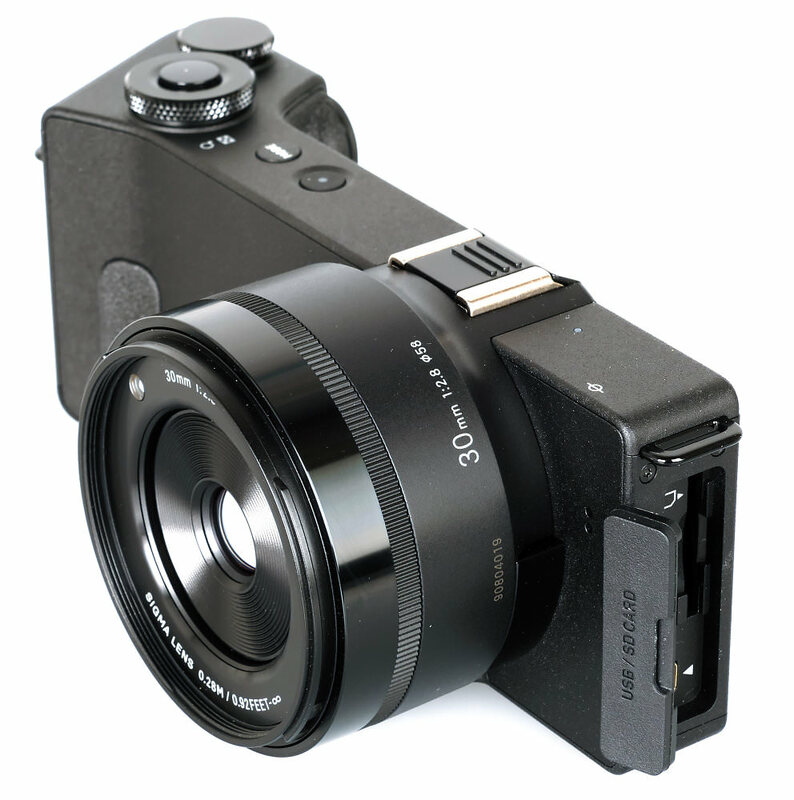 The Sigma dp2 Quattro was announced in February 2014, and caused quite a reaction, due to it's rather unconventional camera design. 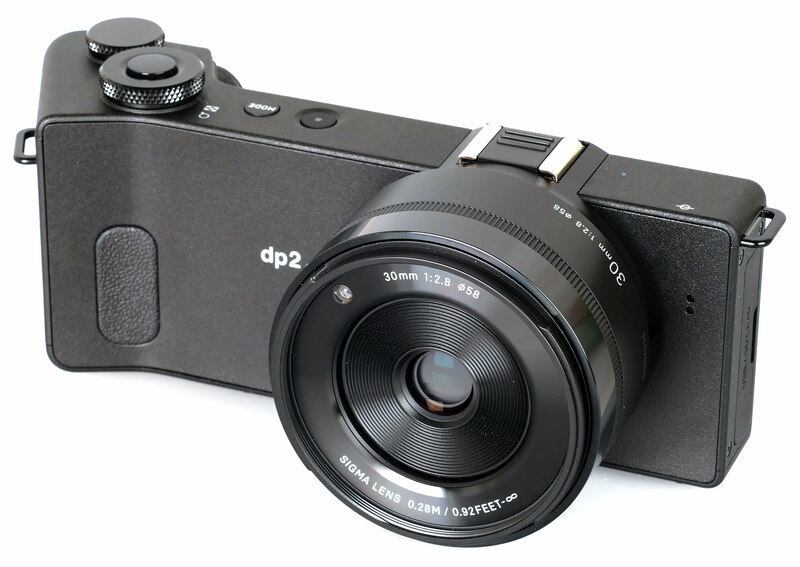 The dp2 Quattro is the middle camera in a range of 3 cameras, each with a different lens option (28mm, 45mm, and 75mm equivalents), updating the Sigma dp2 Merrill, the camera offers a new sensor design, and quicker image processing. The camera records 39 megapixel JPEG images, 19 megapixel raw images, and is available for £899. The Sigma dp2 Quattro features a newly developed Foveon X3 direct image sensor (generation name: “Quattro”), the sensor features multiple layers to capture all of the colour information that visible light transmits, something Sigma calls full-bodied image quality. 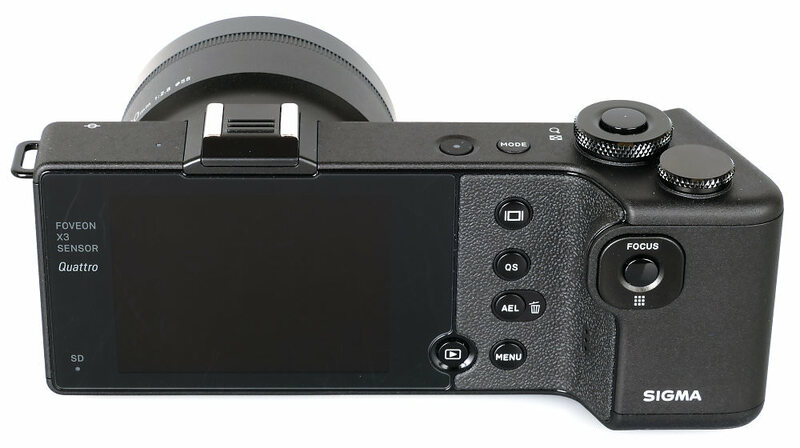 The Sigma dp Quattro series is said to have every aspect of the camera redesigned, with a redesigned sensor, image processing engine, lens and body. Sigma say the combination of an integrated prime lens, and sensor gives the best image quality possible, saying that they are able to acheive better results this way, rather than releasing a mirrorless camera. The camera body design is said to offer a balanced shape, layout and weight distribution, with the cameras said to deliver medium format-level image quality anywhere. 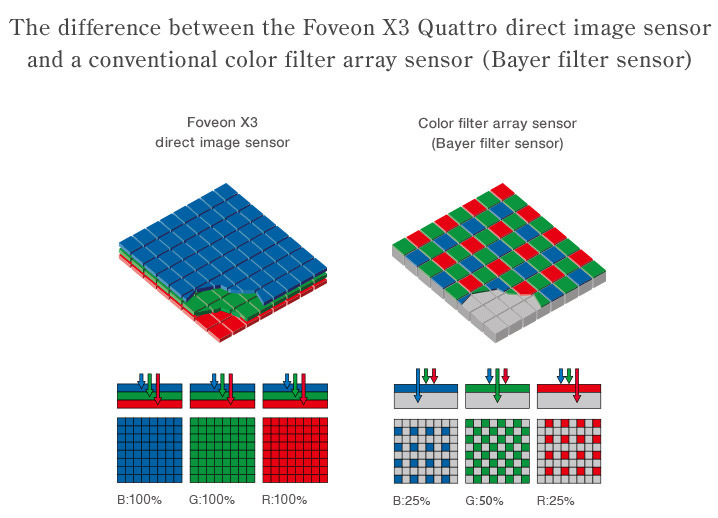 The Foveon X3 Quattro direct image sensor differs from the previous Foveon sensor thanks to a new top layer with a higher resolution, as shown below. This is said to give high resolution results, but with a lower resolution green and red layer, image processing is said to be quicker and noise is also said to be improved. Due to the sensor design, there is no low pass filter, and each pixel records full RGB colour information, thanks to a layered sensor, much like film. The previous Sigma dp Merrill series was said to give the equivalent of a 30 megapixel camera from a 15mp (x3) sensor, while the dp Quattro series is said to give the equivalent of a 39 megapixel camera, from a 29.8 megapixel sensor (20mp + 4.9mp + 4.9mp), when compared to Bayer sensor cameras. Another feature is the panchromatic nature of the sensor that captures information from all wavelengths of light. This makes the camera suitable for black and white photography, and using the built in filters or using the Sigma Photo Pro 6 image processing software you can use black and white filters, much like you would have done if you were shooting black and white film. The Sigma dp2 Quattro features a rather unusual camera design, with the hand grip turning backwards towards you rather than forwards like other cameras available. The design and, as a result, the length of the camera means that it's best operated with two hands, as the camera can feel lens heavy if you try and shoot with just one hand holding the camera. There is a small rubber grip on the front of the camera, and again, almost the opposite of other cameras, there is a larger rubber grip on the rear of the camera, with a protruding area where your thumb can grip the camera, although it's often more comfortable to hold the camera with your thumb underneath the rear command wheel, where there is no rubber grip, but simply the textured camera body. Despite the unusual design of the camera, the camera feels extremely well built with a solid metal body that has a textured feel to it. On the left of the camera is a tough feeling rubber cover which hides the SD memory card slot and USB connection. Underneath the camera are two areas with tough rubber areas much like you would find on professional level Digital SLRs, and the metal tripod socket is in line with the lens. 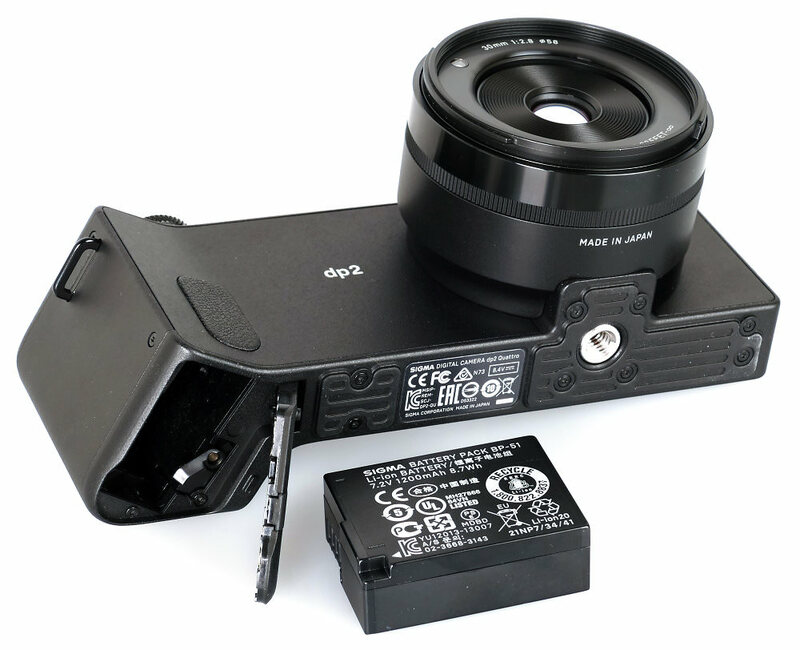 You'll also find the battery compartment under the camera, which houses a new, larger 1200mAh 7.2V (BP-51) lithium-ion battery. Once you do get used to the design and handling of the camera, then the two command wheels on the top feel very good and they make it very easy to change settings on the camera. It's also very easy to change common settings using the QS button, which beings up an on-screen set of options. Due to the rather unusual camera design we would recommend trying to get your hands on the camera in person to see if you find it comfortable to use, if possible. The camera has a built in focus assist LED that helps the camera focus in low light, although focus can become quite slow in low-light conditions. The camera has 9 focus points select-able, or you can move the focus point freely around the centre of the image, and it is possible to change the size of the focus frame to Spot, Regular and Large. The top mode button is used to switch between P/A/S/M and three custom modes. A 3inch screen can be found on the back with a 921k dot resolution, although the display isn't particularly quick to refresh, and does look quite pixelated when taking photos. The menus look much better, and the screen is a gapless design meaning viewing angles are very good. Menus – The menu system is very well designed, with colour coded sections, making it easy to find and change settings. The QS button also gives quick access to the most common options, and when used with the command wheels it makes it easy and quick to change settings. Battery life - Battery life is rated at 200 shots according to Sigma / CIPA test results, which is below average, however the inclusion of a second battery brings the total number of shots possible up to a much more respectable 400 shots. Shutter response is very quick, however focus is on the slow side, with a slow shot to shot time as well. Continuous shooting is quick, at 4.2fps, however it can take a while for the camera to write the 7 shots to the memory card, particlarly when shooting raw images, so a high speed memory card is recommended. Sample Photos - Colour and JPEG output from this camera is significantly improved compared to the previous versions, as the JPEG results from this camera are exceptional, with little need to convert the raw images. Previous versions required raw conversion to get the best colour from the camera. Not having to convert the raw images is particularly beneficial as the raw images are very large at 50-60MB+, and the photo processing software, Sigma Photo Pro 6, can be particularly slow to use. The camera has reliable exposure, and dynamic range is good, with the raw files offering the ability to recover lost shadows and highlights using Sigma Photo Pro. Skin tones can be very good using the Portrait setting (as the standard setting can be a little too contrasty), although care needs to be taken about shadows, and lower noise images can be produced converting the raw files. Lens Performance - Detail recorded by the camera is simply stunning, with excellent levels of detail across the frame, when compared to typical Bayer sensor cameras, with each pixel recording the full colour information it results in every pixel recording impressive levels of detail, something that is very difficult to acheive with other cameras. Chromatic aberration was very minimal, as was purple fringing. There is a little vignetting when shooting at f/2.8, but this is quickly resolved as the lens is stopped down, and barrel distortion is quite low. With the closest focusing distance of 28cm, the dp2 Quattro is not ideally suited for close up photography, and for this we would recommend looking at the dp3 Quattro which has much better close-up focusing ability. ISO Noise Performance - For the lowest noise and best detail possible we would recommend using ISO100 to ISO200, as images have low levels of noise and exceptional levels of detail. For lower light situations ISO400 still provides good results, although noise increases and detail is reduced slightly. At ISO800 noise levels become strong and we would recommend avoiding this setting if possible, although results may still be useful if resized and used on the web, or additional noise processing is applied. ISO1600 and above is best avoided as noise is extremely high, and detail is low, with a significant loss of colour at ISO3200 which continues at ISO6400. White Balance Performance - Auto White Balance (AWB) performs reasonably well under tungsten lighting, with the tungsten preset giving a warm / yellow colour cast. AWB performs well under fluorescent lighting, with the fluorescent preset giving a green colour cast. Digital Filters - In standard (and other) colour mode(s) you can alter the contrast, sharpness and saturation. In the mono shooting mode on the camera, you can alter the contrast, sharpness, filtering effect (Off, Yellow, Orange, Red, Green, and Blue), and toning effect (B&W, Red, Warm tone, Sepia, Green, Blue Green, Blue, Cold Tone, Blue Purple, and Purple). 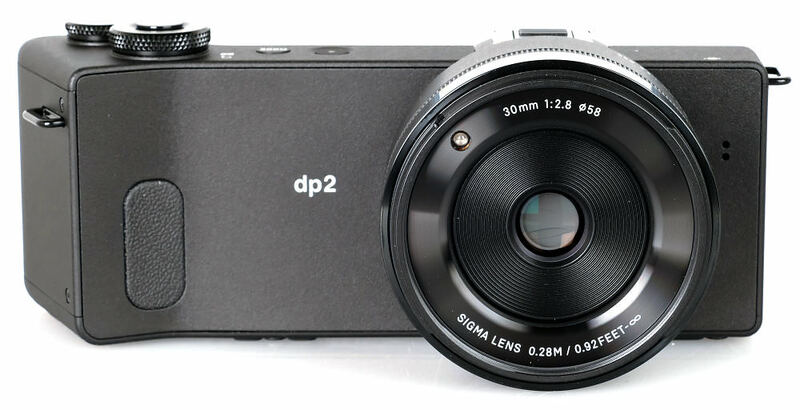 The Sigma dp2 Quattro is available for £899, which makes it reasonably good value for money. For those with a more limited budget, then the previous versions, the Sigma dpx Merrills now offer excellent value for money, although do require raw image processing for the best results. Alternatively to get a similar high resolution result, you would need to look at the Nikon D810, or Sigma SD1 Merrill Digital SLRs. The Sigma dp2 Quattro and other Sigma cameras are difficult to compare directly to other cameras, as they are unique in being the only camera available that uses a multi-layer sensor solution where every pixel records all colour information. It's because of this sensor technology that the camera is able to deliver the image quality that it produces, but it also means that due to the large raw files, that image processing times are slow in comparison to other cameras. The dp2 Quattro is significantly larger than previous versions of the camera, and whilst the original Sigma dp1/2 series were relatively pocketable, this changed with the dpx Merrill series, making them more jacket pocket cameras, this time with the Quattro series, the cameras are much more suited to being carried in a camera bag, rather than a jacket pocket, which is a shame, as originally that was one of the key benefits of the Sigma cameras, an APS-C sensor and DSLR quality in a pocketable camera. 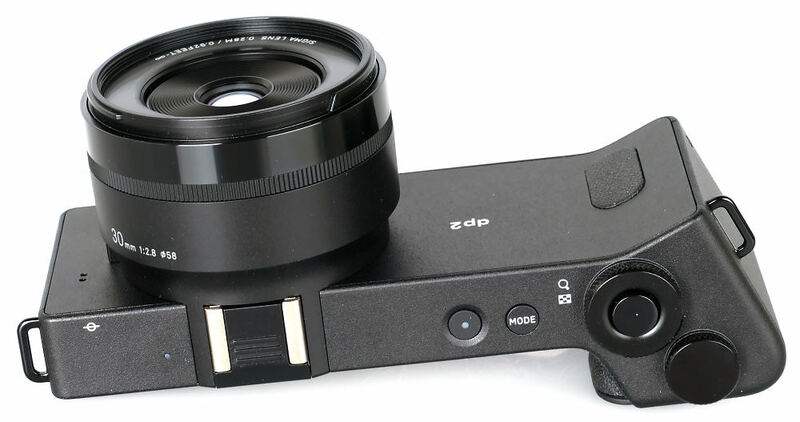 The dp2 Quattro promises medium format quality in a portable camera, and is certainly much smaller than a medium format camera, but is definitely large for a "compact camera". Due to the large raw files produced by the camera a large memory card is definitely recommended. Without doubt, the Sigma dp2 Quattro delivers some of the most detailed, crisp and sharp photos available, with excellent colour reproduction, and like previous Foveon cameras, stunning pixel level detail, great if you want to enlarge pictures, or view at 100%. There are however some drawbacks, which are now expected with Foveon sensor cameras, namely that as soon as you increase the ISO speed to ISO400 or above, then you will begin to see a lot of noise in images, and as a result we would recommend that you not use any ISO setting higher than ISO400. If you love the look of the images from the Sigma dp2 Quattro, then the price of the camera is quite reasonable, similar in price to many other large sensor prime lens cameras when they were first released. For those that have previous versions of the camera, the image quality improvements would make the new Quattro camera well worth investing in. The biggest news for me is...you don't have to shoot Raw to get excellent IQ. Now, the design...eh...ok, we need wide angle (28mm eqv. or more) and one day I might buy SIgma! However it will take some time so my GR isn't worried yet! [quote]If I had the money ill get one, but I really wish they would make a 35mm version (or go for it and attach the 18-35! )[/quote] They make 28, 45 and 75mm equivalent versions. They make 28, 45 and 75mm equivalent versions. This is exactly the type of camera purist 'street' photographers have been crying out for - great IQ and no frills to get in the way of their art. Will they buy it? - No chance! This is exactly the type of camera purist 'street' photographers have been crying out for - great IQ and no frills to get in the way of their art. Will they buy it? - No chance! Is it just me, or is the image quality from this camera very close to medium format level, but at a bargain-basement price? I can't think of any DSLR I've come across that produces this quality at 100% viewing. Such a shame that even reasonably low ISOs lead to the image quality tailing off so quickly on this camera - but it's surely worth using it for tripod-only landscapes, etc, if this level of detail and sharpness can be achieved at such a low price. Quote:The biggest news for me is...you don't have to shoot Raw to get excellent IQ. Now, the design...eh...ok, we need wide angle (28mm eqv. or more) and one day I might buy SIgma! However it will take some time so my GR isn't worried yet! [quote]Is it just me, or is the image quality from this camera very close to medium format level, but at a bargain-basement price? I can't think of any DSLR I've come across that produces this quality at 100% viewing. Such a shame that even reasonably low ISOs lead to the image quality tailing off so quickly on this camera - but it's surely worth using it for tripod-only landscapes, etc, if this level of detail and sharpness can be achieved at such a low price. [/quote] Foveon sensor can directly compete with MF cameras, it is that good and has the potential. ISO is the only tradeoff for this type of sensor. I'd so like to compare this with my D800E. Quote:Is it just me, or is the image quality from this camera very close to medium format level, but at a bargain-basement price? I can't think of any DSLR I've come across that produces this quality at 100% viewing. Such a shame that even reasonably low ISOs lead to the image quality tailing off so quickly on this camera - but it's surely worth using it for tripod-only landscapes, etc, if this level of detail and sharpness can be achieved at such a low price. Foveon sensor can directly compete with MF cameras, it is that good and has the potential. ISO is the only tradeoff for this type of sensor. I'd so like to compare this with my D800E.